After leaving Tsankawi we wound our way 12 miles to the main visitors center at Bandelier National Monument, which sits in Frijoles Canyon. The clouds had rolled in by the time we arrived (around 3 pm) and the temperature was dropping. I suspect, in the height of the season, that parking is a challenge. On an overcast April afternoon we had our choice of spots. 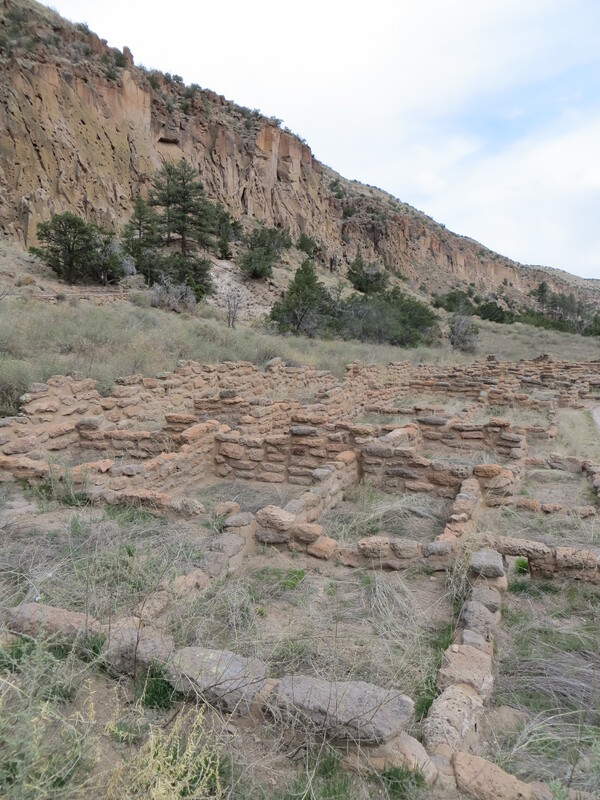 We wandered into the visitor’s center and decided, given the time, to do just the Main Loop Trail, a 1 ½ mile loop that takes you through some impressive ruins and exposes you to even more impressive cliff dwellings. By that time it was 3:30. A park ranger informed us that the visitors center closed at 4:30, which was disappointing as I had hoped to have time to find a book about the Pueblo Indians in the bookstore. We were excited to get on the trail, so we did a too-quick skim through, which produced only a magnet (but a cool magnet), then hit the trail. Much of the information I’ll be sharing comes from the Main Loop Trail Guide that we purchased for $1 (inflation since we were at the main visitors center…we only paid 50 cents for our Tsankawi trail guide). 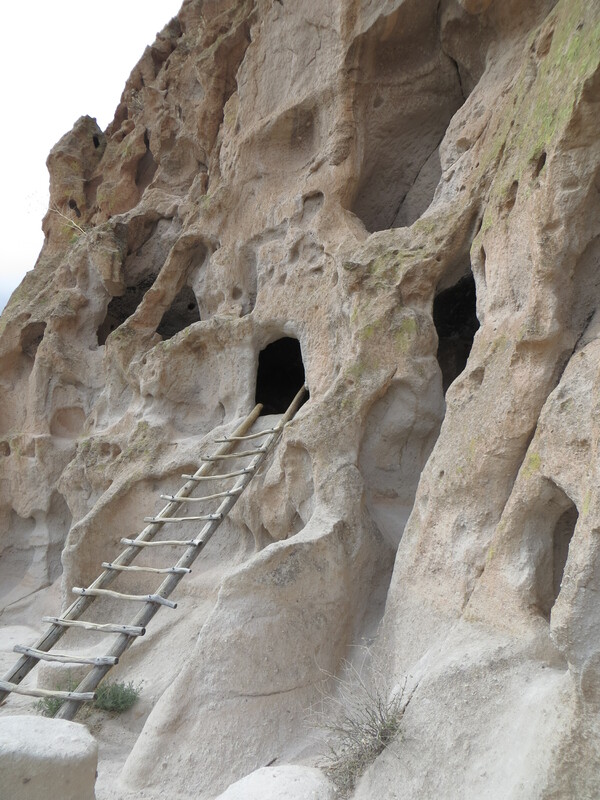 Early structures in the area that is now known as Bandelier National Monument took the form of pit houses and were largely built underground. Above-ground stone dwellings, like we saw, gradually replaced pit houses. The people who settled in the Frijoles Canyon are known as the Ancestral Pueblo people. In the past they were referred to as the Anasazi, but this roughly translates to “ancient enemies” in the Navajo language, so the term is no longer used. The Ancestral Pueblo people are a different group than the Tsankawi. Just like Tsankawi, the eruptions of the Jemez volcano fill this area with tuff, a soft crumbly rock. Tuff is very easily eroded and over time the exposed rock takes on a “Swiss cheese” appearance, which was very obvious in Frijoles Canyon. 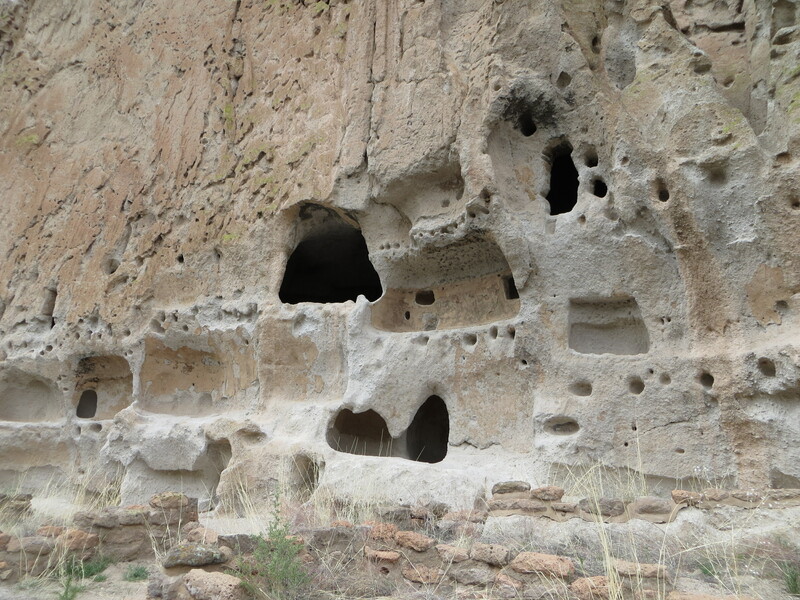 Ancestral Pueblo people used tools to enlarge some of the small natural openings in the cliff face and stone dwellings were constructed in front of these enlarged openings. 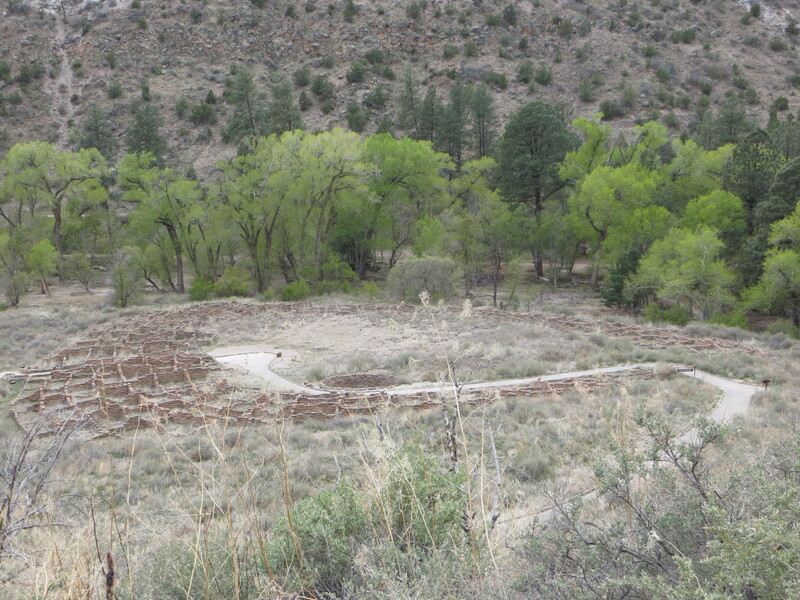 One of the first things we came across on our hike (which was more like a walk) was a kiva. 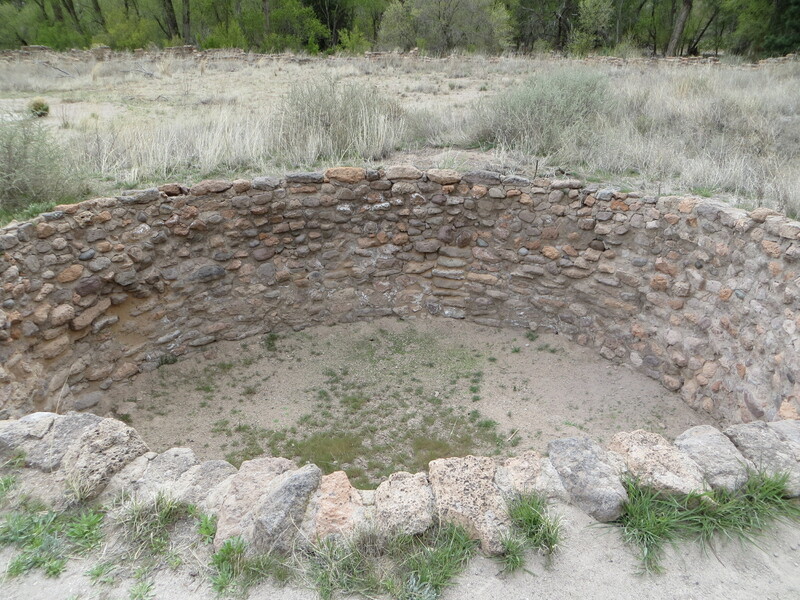 Kiva’s were a center of the community, not only for religious activities, but also for education and decision-making. When in use, the kiva would have been covered with a roof made of wood and earth. 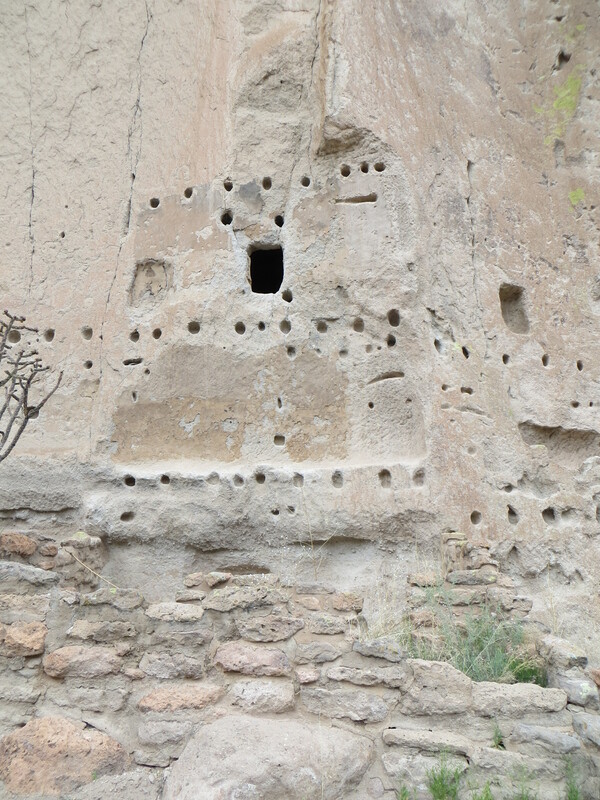 People entered the kiva using a ladder through an opening in the roof. Torches provided the only light within the kiva. The following pictures are of remnants of the village of Tyuonyi. 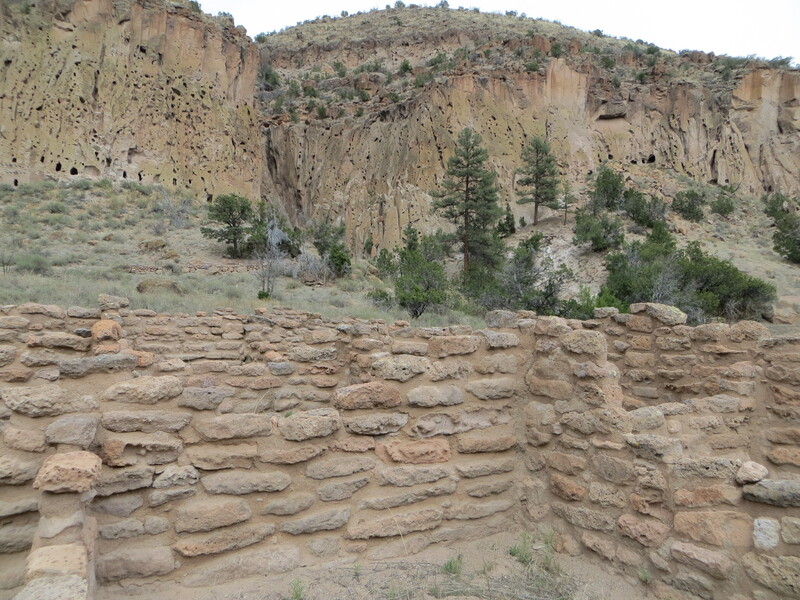 Homes of the Ancestral Pueblo people were not confined to walls of Frijoles Canyon. One to two stories high, Tyuonyi contained about 400 rooms and housed approximately 100 people. A central plaza contained three kivas. Access to the village was through a single ground-level building. Construction of Tyuonyi began more than six hundred years ago; the caves were occupied at the same time. The choice to live in the caves or in the canyon bottom may have been based on family, clan custom or maybe simply preference. 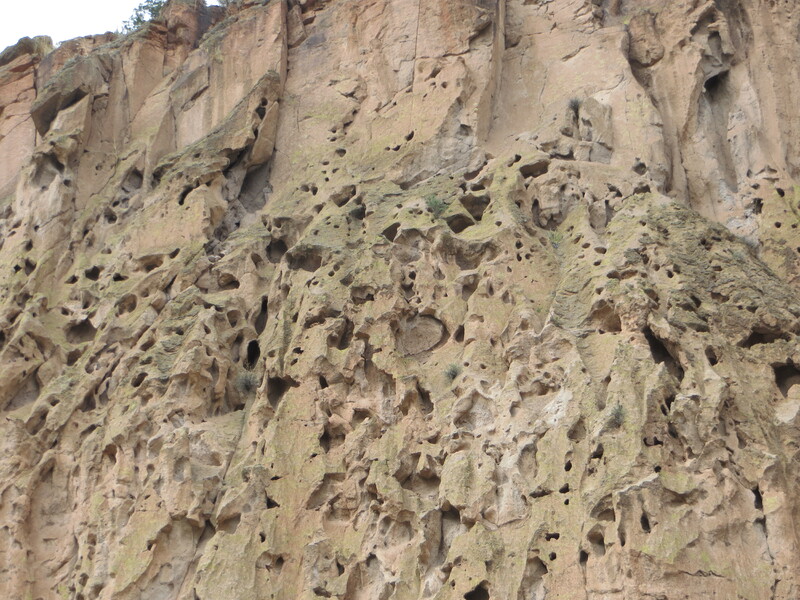 Caveates litter the Southern wall of Frijoles canyon. Even though the tuff is soft it would have been quite a task to carve them using only stone tools. 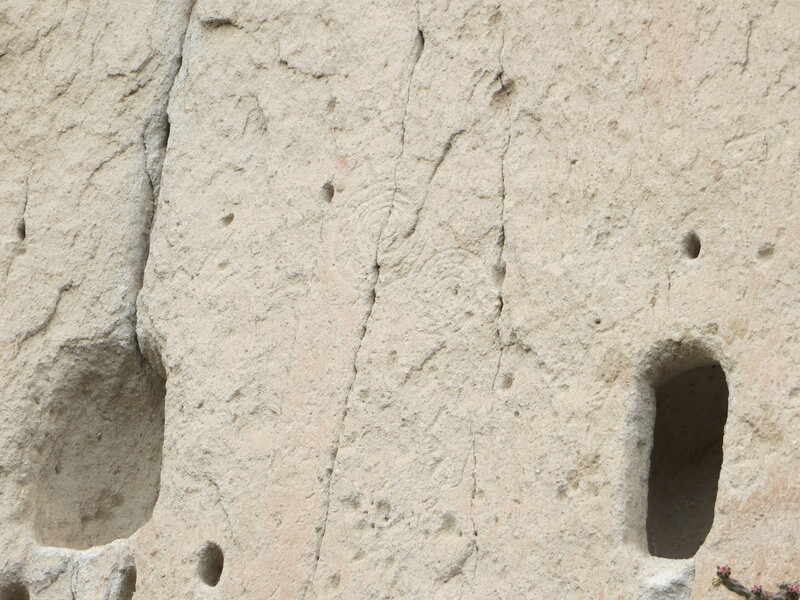 Most cavates had stone rooms built in front of them. The lower walls of cavates were usually plastered and painted while the ceilings were smoke-blackened. 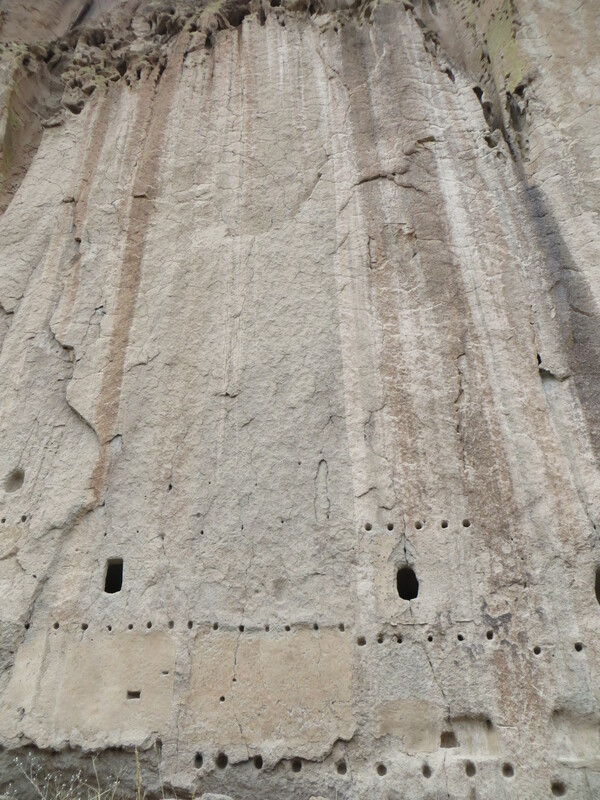 Smoking the ceilings hardened the volcanic tuff and made it less crumbly. By building dwellings against the rock face, housing units could be several stories tall. You can determine how many stories were present by counting the rows of holes. Extended families lived together. Each group had their own storage rooms, sleeping quarters and kiva. The house below was reconstructed in 1920 to give visitors an idea of how some cliff homes may have looked. New archeological information suggests the construction may not be completely accurate as entry to this dwelling was probably through a doorway in the roof. We paused at about this point. Just stopped. In our tracks. 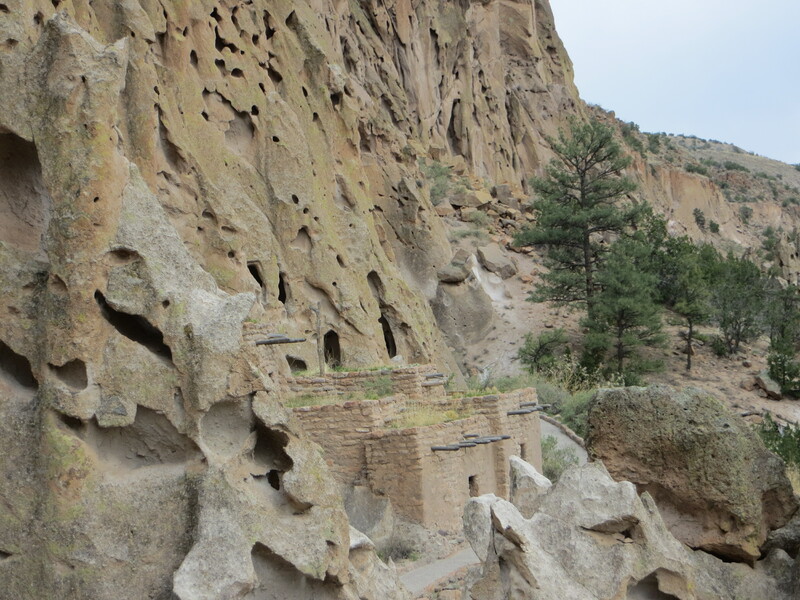 In awe of the remnants of these cliff dwellings. They are a marvelous feat to behold. It was made even more fantastic by the silence. It was now after 4 pm. There were very few people left on the trail. When we stood in front of the canyon wall we were the only ones there. It was an experience that I will not soon forget. Is at Tsankawi, petroglyphs litter the walls of Frijole Canyon. 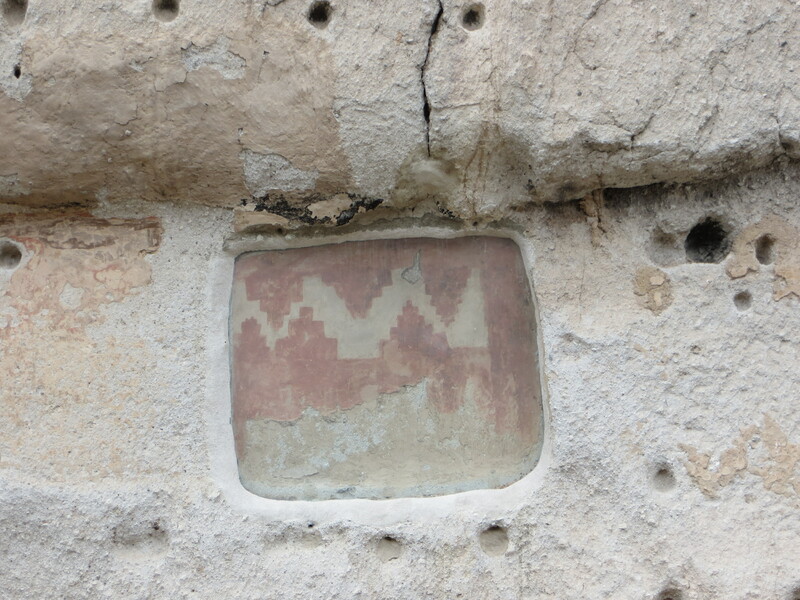 The pictograph was part of the back wall of a second-story dwelling. Uncovered behind a layer of plaster, the pictograph was probably created for a very special purpose, then later covered over. The average life expectancy for Ancestral Pueblo people was about 35 years. They stood approximately 5’ tall for the average woman and 5’6” for the average man. Arthritis and bad teeth were common ailments. Childbirth was a dangerous process, taking many women’s lives. Likewise, many children did not survive to adulthood. 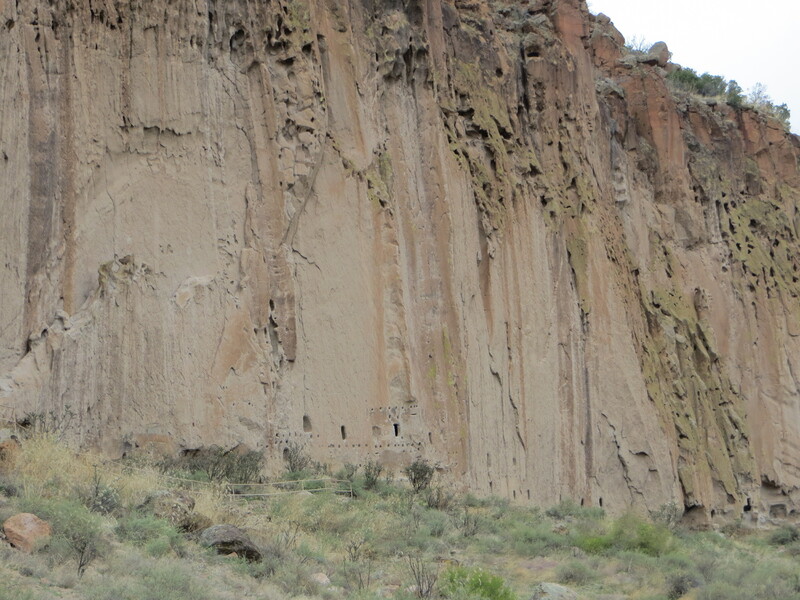 The earliest evidence of a collection of dense settlements within Frijoles Canyon dates to the mid-1200’s. However, it was not until the mid-1300’s that large-scale construction of villages like Tyuonyi took place. It is estimated that maximum population reached an all-time high of more than 500 people in the late 1400’s. It’s not clear what caused the population to move on, could have been drought, famine, any number of things. What is clear is that this is a magnificent historical specimen, one we thoroughly enjoyed on a cold, quiet April afternoon.